Background: Monocyte chemoattractant protein 1 (MCP-1) is a member of the C-C chemokine family and exerts strong chemoattractant activity in monocytes, macrophages, and lymphocytes. Rat pancreatic fibrosis induced by dibutyltin dichloride (DBTC) is considered to be an appropriate chronic pancreatitis model histologically and enzymatically, as has demonstrated in a previous study. Aim: We examined the effect of human dominant negative inhibitor of MCP-1 (mutant MCP-1) on progression of chronic pancreatitis induced by DBTC in a rat model. Methods: We used the experimental model of chronic pancreatitis induced by DBTC in rats. Mutant MCP-1 or empty plasmid at a dose of 50 µg/body weight was administrated into rat thigh muscles on days 4, 11, and 18 after administration of DBTC. On days 14 and 28, we evaluated the effect of mutant MCP-1 morphologically and biochemically. 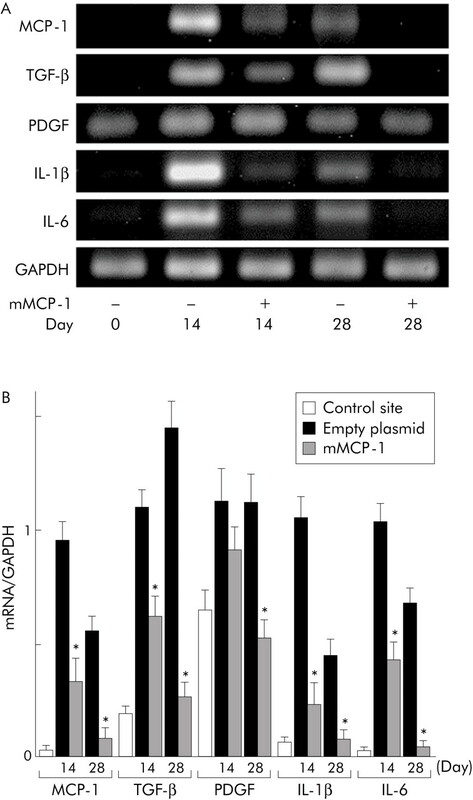 Results: The mutant MCP-1 treated group inhibited early pancreatic inflammation and later pancreatic fibrosis histologically, and showed a decrease in serum MCP-1 concentration, intrapancreatic hydroxyproline, α-smooth muscle actin, and an increase in intrapancreatic amylase and protein content compared with the empty plasmid treated group. The mutant MCP-1 group also inhibited intrapancreatic mRNA expression of cytokines and chemokines. Conclusions: : Our findings suggest that monocyte/macrophage recruitment and the systemic MCP-1 signal pathway contribute to progression of chronic pancreatitis, and that blockade of MCP-1 may suppress the development of pancreatic fibrosis. In the present study, we evaluated the use of gene therapy to block MCP-1 activity in vivo using an amino terminal deletion of mutant MCP-1 (mMCP-1), which lacks the terminal amino acids 2–8 and works as a potent dominant negative MCP-1 agonist.11,12 A previous study showed that skeletal cells infected with mMCP-1 secrete mMCP-1 protein into circulating blood and that mMCP-1 protein competitively binds to the receptor for MCP-1 (C-C chemokine receptor (CCR-2)) on monocytes or target cells in remote organs, thus blocking the MCP-1 signal and suppressing MCP-1 mediated inflammation. This results in an improvement in the function of the target organ.13 Therefore, the aim of our study was to examine the effect of dominant negative inhibitor of MCP-1 (mMCP-1) on progression of the chronic pancreatitis model induced by DBTC in rats. Adult male Lewis rats (KBT Oriental, Saga, Japan) weighing 180–200 g were used. They were maintained in accordance with the guidelines of the Committee on Animal Care of Kyushu University. The experimental model of chronic pancreatitis was induced by a single intravenous administration of DBTC (Schering AG, Berlin, Germany), as described previously.10 Four days after DBTC injection, these rats were randomly divided into two groups and animals then received an intramuscular injection of mMCP-1 or empty plasmid. The experimental protocol is summarised in fig 1. Each rat was sacrificed at indicated days Blood samples were collected to measure serum MCP-1 levels. Each pancreas was quickly removed and weighed. A part (tail) of each pancreas was used for histopathological analysis (haematoxylin-eosin staining, azan staining, and immunostaining for α smooth muscle actin (α-SMA)). The remaining part of each pancreas was divided and one part was homogenised in 9 volumes of ice cold buffer (50 mM Tris HCl buffer, pH 8.0, 0.5% Triton X-100), as described previously.10 The homogenates were centrifuged at 12 000 g for 20 minutes at 4°C. The supernatants were used for assay of amylase and protein concentrations. Another part was used for reverse transcription (RT)-PCR or western blotting. A third part of the pancreas was homogenised in 9 volumes of ice cold saline used for the hydroxyproline assay. Experimental protocol. The dibutyltin dichloride (DBTC) solution was injected at a dose of 7 mg/kg body weight on day 0. Mutant monocyte chemoattractant protein 1 (mMCP-1) or empty plasmid (pcDNA3) was injected at a dose of 50 μg/body into the thigh muscles on days 4, 11, and 18 after DBTC injury. Five rats from each group were sacrificed on days 14 and 28. The effect of mMCP-1 gene transfer was evaluated morphologically and biochemically. Amylase was measured by the Phadebas amylase test (Pharmacia Laboratories, Piscataway, NJ, USA).15 Protein content was determined by the method of Lowry and colleagues.16 Hydroxyproline was determined by a modified method according to Weidenbach and colleagues.17 Assay of endogenous MCP-1 was measured using a rat MCP-1 ELISA kit (Biosource), and mMCP-1 was measured using human specific ELISA kit (Biosource, Camarillo, California, USA), according to the manufacturer’s instructions. Cross reaction of each species was less than 5% (data not shown). Total RNA was extracted from pancreatic tissue by the Isogen (Nippon Gene, Tokyo, Japan) method, as described previously.18 First standard DNA was synthesised using reverse transcriptase (River Tra Ace- Toyobo, Tokyo, Japan) according to the manufacture’s protocol. PCR primers and conditions are listed in table 1. PCR products were detected as a single band of the expected size in each PCR. The intensity of the bands was analysed using the image analysis software NIH image version 1.62 (National Institutes of Health, Bethesda, USA). Pancreatic tissue was homogenated in sodium dodecyl sulphate (SDS) lysis buffer (50 mM Tris HCl, pH 7.5, 2% SDS, trypsin inhibitor at 0.2 mM), sonicated for 10 seconds, boiled for five minutes, and centrifuged at 10 000 rpm for 15 minutes. Equal amounts of protein (10 μg) were electrophoresed through 12.5% SDS polyacrylamide gel (Bio-Rad, California, USA) and transferred to a Hybond-p (Amersham Biosciences Inc., Piscataway, New Jersey, USA). The membrane was incubated with primary antibody against α-SMA (Sigma-Aldrich, St Louis, Missouri, USA) at a dilution of 1:2000 or antibody against tubulin (Sigma-Aldrich, St Louis, Missouri, USA) at a dilution of 1:400, at 4°C overnight. After incubation with horseradish peroxidase labelled biotin rabbit antimouse IgG (Zymed, California, USA) for one hour, proteins were visualised using an ECL kit (Amersham Biosciences Co., Piscataway, New Jersey, USA). For immunohistochemistry, representative tissue sections were subjected to immunostaining for macrophages/monocytes using a primary monoclonal mouse anti-rat ED1 IgG antibody (Serotec; Dainippon, Osaka, Japan)20 diluted to 1:200, and a development method (Nichirei, Tyokyo, Japan) was used for ED-1 positive cell detection. Immunostaining for MCP-1 using goat antirat MCP-1 IgG antibody (Santa Cruz, California, USA)21 and for α-SMA using mouse monoclonal anti-α-SMA antibody (Dako, Kyoto, Japan), diluted to 1:100, was carried out and signals were then developed using an avidin-biotinylated peroxidase complex method. Morphometric analysis was performed with a microscope that had a computerised digital image analysis system (Mac scope) by two observers who were blinded to the treatment protocol. The number of ED1 positive cells were counted by two blinded observers in each section (five high power fields) and the average of the positive cells per section was reported. Results are expressed as means (SEM). The Student’s t test was used for statistical analysis. P values of <0.05 and <0.01 were accepted as statistically significant. Following DBTC administration, the body weight of rats was decreased, probably because of pancreatic dysfunction. However, the mMCP-1 treated group preserved or prevented loss of body weight (table 2). In our study, pancreatic interstitial oedema and inflammatory cell infiltration, and pancreatic fibrosis were evident in the pancreas on day 14 (fig 2B) compared with normal rat pancreas (fig 2A). On day 28, we observed more widespread progression of interstitial fibrosis with infiltrating mononuclear cells, tubular complex formation, fatty change, and destruction of acinar cell and lobular architecture (fig 2D). In contrast, the mMCP-1 treated group inhibited early pancreatic inflammation on day 14 (fig 2C) and extended pancreatic fibrosis on day 28 (fig 2E) compared with the empty plasmid treated group. These microscopic results are described in table 3. Microscopic findings in the pancreas. Rats transfected with the mutant monocyte chemoattractant protein 1 (mMCP-1) gene attenuated the development of pancreatic fibrosis induced by dibutyltin dichloride (DBTC). Representative photomicrographs of pancreatic tissue sections are shown. (A) Normal control rat. (B) DBTC+empty plasmid group on day 14. (C) DBTC+mMCP-1 group on day 14. (D) DBTC+empty plasmid group on day 28. (E) DBTC+mMCP-1 group on day 28. Haematoxylin-eosin stain; original magnification ×100. Pancreatic protein in the empty plasmid treated group decreased significantly to 116.8 (13.9) mg/g on day 14 and to 99.1 (10.6) mg/g on day 28 compared with that of normal rats (204.1 (11.9) mg/g) whereas in the mMCP-1 treated group it increased to 158.9 (11.4) mg/g on day 14 and to 176.6 (8.8) mg/g on day 28 (fig 3A). Similarly, pancreatic amylase in the empty plasmid treated group decreased significantly to 5693.0 (523.5) SU/dl on day 14 and to 4644.2 (154.3) SU/dl on day 28 compared with that of normal rats (28 369.6 (2024.1) mg/g) whereas in the mMCP-1 treated group it increased to 15 323.8 (2954.3) SU/dl on day 14 and to 23 311.3 (2065.8) SU/dl on day 28 (fig 3B). Effect of intramuscular transfer of the mutant monocyte chemoattractant protein 1 (mMCP-1) gene on pancreatic content of protein (A) and amylase (B), as well as serum MCP-1 concentrations (C) on days 14 and 28 after dibutyltin dichloride (DBTC) injury. Values are means (SEM) (n = 5). Significant differences: *p<0.05, **p<0.01, mMCP-1 treated group versus empty plasmid treated group. Serum MCP-1 concentrations in the mMCP-1 treated group on days 14 and 28 (0.195 (0.024) ng/ml, 0.155 (0.005) ng/ml, respectively) markedly decreased compared with those in the empty plasmid treated group on days 14 and 28 (0.387 (0.051) ng/ml, 0.225 (0.023) ng/ml, respectively). However, MCP-1 levels were also low in normal rats (0.148 (0.002) ng/ml) (fig 3C). Azan staining was associated with pancreatic fibrosis, which stained blue in Azan stained sections. The mMCP-1 treated group (fig 4B) showed less fibrosis than the empty plasmid treated group (fig 4A) on day 28. α-SMA was characterised as a marker of pancreatic stellate cell activation. 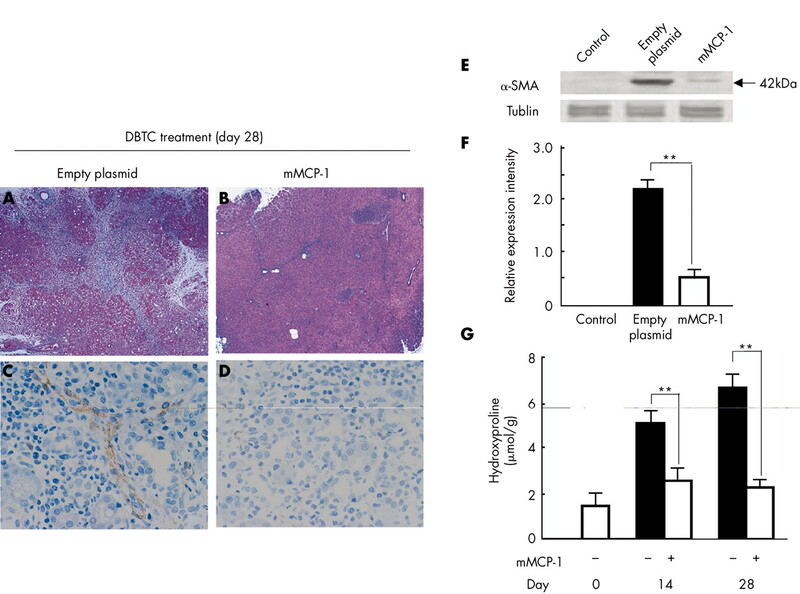 The number of α-SMA positive cells completely resolved in mMCP-1 treated rats (fig 4D) compared with the empty plasmid treated rats (fig 4C) on day 28. Administration of mutant monocyte chemoattractant protein 1 (mMCP-1) attenuated the severity indicators of pancreatic fibrosis. Pancreatic tissue sections from empty plasmid and mMCP-1 groups on day 28 after injury stained with Azan stain (A, B) and stained immunohistochemically for α smooth muscle actin (α-SMA) (C, D). (E) Representative western blot of α-SMA; tubulin was used as a loading control. (F) Densitometric analysis of mMCP-1 on pancreatic α-SMA protein expression on day 28 after injury. Grouped data are presented of four independent experiments. (G) Effect of intramuscular transfer of the mMCP-1 gene on pancreatic content of hydroxyproline on days 14 and 28 after dibutyltin dichloride injury. Values are means (SEM) (n = 5). Significant differences: **p<0.01, mMCP-1 treated group versus empty plasmid treated group. As shown in fig 4E, α-SMA protein expression was determined by western blot analysis, which detected an immunoreative band with a molecular mass of 42 kDa. Pancreatic α-SMA expression of the empty plasmid treated group markedly increased on day 28 compared with normal rats whereas its expression was reduced by mMCP-1 gene transfer (fig 4F). Similarly, pancreatic content of hydroxyproline as a marker of fibrosis did not increase on days 1, 3, or 7 (data not shown) but significantly increased to 5.08 (0.51) μmol/g on day 14 and to 6.66 (0.87) μmol/g on day 28 compared with the control group (1.46 (0.23) μmol/g) whereas in the mMCP-1 treated group it was reduced to 2.56 (0.43) μmol/g on day 14 and to 2.28 (0.26) μmol/g on day 28 (fig 4G). In rats, inflammation (ED-1 positive monocytes/macrophages) was markedly less in the mMCP-1 treated group (fig 5B) than in the empty plasmid treated group (fig 5A) on day 14, and especially on day 28. mMCP-1 treated rats (fig 5D) also had markedly reduced MCP-1 expression compared with the empty plasmid treated rats (fig 5C) on day 28. Monocyte/macrophage recruitment was prevented by mMCP-1 gene transfer (fig 5E). 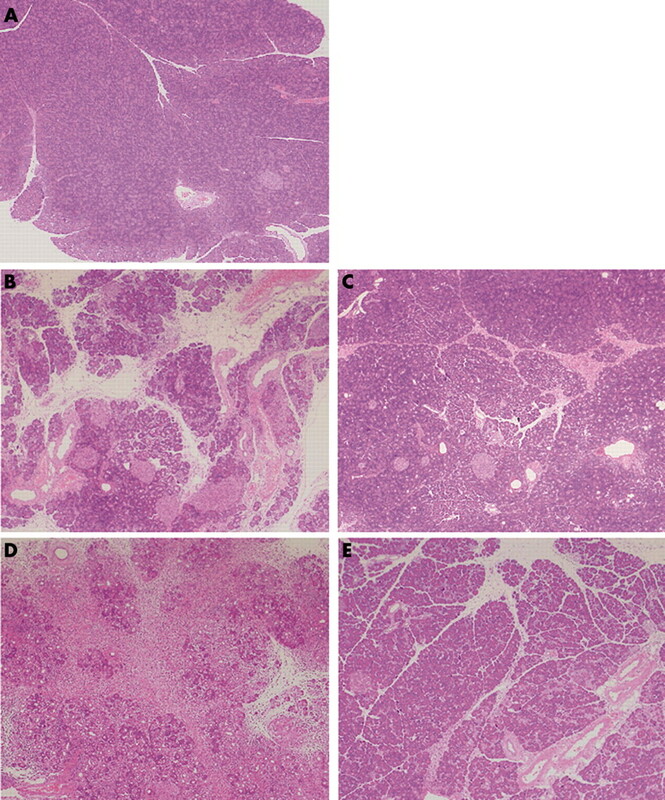 Immunohistochemistry of the pancreas for ED-1 (A, B), monocyte chemoattractant protein 1 (MCP-1) (C, D), and quantification of ED-1 positive cell number (E). Representative pancreatic tissue sections on day 28 after dibutyltin dichloride (DBTC) administration from a rat transfected with empty plasmid and a rat transfected with mMCP-1 gene were stained immunohistochemically for MCP-1 or ED1. Large mononuclear cells in the pancreatic interstitium were stained with anti-MCP-1 antibody (original magnification ×200). ED-1 positive cells (brown labelled cytoplasm) indicating macrophages/monocytes, infiltrated into the pancreatic parenchyma (original magnification ×200). ED-1 positive cells were counted in five high power fields (×200) in the pancreas. Total number was expressed. Values are means (SEM) (n = 4∼5). Significant differences: *p<0.01, mMCP-1 treated group versus empty plasmid treated group on day 28 after DBTC treatment. Intrapancreatic mRNA expression of MCP-1, TGF-β, PDGF, IL-1β, and IL-6 are shown in (fig 6A). The level of MCP-1 mRNA was almost undetectable in normal rats whereas on days 14 and 28 markedly increased MCP-1 mRNA expression was observed. In contrast, expression was limited by mMCP-1 gene transfer. Similarly, mRNA expression of other chemokines and cytokines was observed on days 14 and 28 after DBTC treatment compared with the control group. mRNA expression was partly but significantly reduced in the mMCP-1 treated group (fig 6B). Expression of various inflammatory cytokines, chemokines, and growth factor. Each rat pancreas was harvested and frozen on the indicated days, and total RNA from pooled samples was isolated and subjected to reverse transcription-polymerase chain reaction (RT-PCR). The cDNA obtained from the pancreas was amplified with monocyte chemoattractant protein 1 (MCP-1), transforming growth factor β (TGF-β), platelet derived growth factor (PDGF), interleukin (IL)-1β, IL-6, and glyceraldehyde phosphate dehydrogenase (GAPDH). (A) Representative RT-PCR results for each group. (B) Relative intensity of PCR production bands were analysed using an NIH image, as described previously. Data are expressed as the ratio of each mRNA to the corresponding GAPDH mRNA. Values are means (SEM) (n = 3). *p<0.05 mMCP-1 treated group versus empty plasmid treated group. To measure mMCP-1 released by transfected skeletal muscle, mMCP-1 or empty plasmid at a dose of 50 μg/body was administrated into rat thigh muscles on day 4 after DBTC application. Regarding the level of transgene expression, we detected higher transgene expression in muscle than in serum (table 4). Chronic pancreatitis is recognised as a chronic inflammatory disease, and is characterised by progressive loss of parenchyma and subsequent loss of pancreatic exocrine and endocrine function. Morphological findings in chronic pancreatitis, such as inflammatory infiltration of pancreatic tissue, fibrosis, atrophy of acinar cells, calcification, pancreatic duct strictures, etc., can be found at the very beginning of the disease. The second stage of the disease is characterised by various degrees of exocrine dysfunction, and later on endocrine dysfunction.22 Recent studies have suggested that recruitment of monocytes/macrophages play an important role in the development of chronic pancreatitis.7 Monocyte/macrophage recruitment to the inflammatory process releases various cytokines, growth factors, and chemokines. Chemokines induce cell migration and activation by binding to specific cell surface receptors on target cells. MCP-1 in particular may play a central role at the site of inflammation, resulting in initiation and progression of various diseases. Rollins reported that mMCP-1 and normal MCP-1 formed a heterodimer, bound to CCR-2, and completely inhibited MCP-1 mediated monocyte chemotaxis in vitro.23 Therefore, we performed the present study to evaluate the effect of mMCP-1 in blocking MCP-1 activity in vivo and determined whether it was effective in preventing the development of pancreatic fibrosis induced by DBTC in a rat model. In our study, pancreatic content of amylase and protein was improved by mMCP-1 gene transfer. For pancreatic fibrosis in particular, enzymatically, the pancreatic content of hydroxyproline, as an indicator of pancreatic fibrosis, was reduced by mMCP-1 gene transfer, and histologically, Azan stain showed less pancreatic fibrosis in the mMCP-1 treated group. Hence these findings indicate that pancreatic fibrosis induced by DBTC may be attenuated by mMCP-1 gene transfer. Immunohistochemically, suppression of MCP-1 producing cells and ED-1 positive cell infiltration into the pancreas were evident in the mMCP-1 treated group. Also, endogenous expression of MCP-1 in serum markedly decreased after mMCP-1 gene transfer. Hence the implication is that the beneficial effects of mMCP-1 gene transfer may be caused mainly by suppression of monocyte and macrophage recruitment and activation. Therefore, early inhibition of the MCP-1 signal may prevent the autocrine/paracrine recruitment of monocytes/macrophages in the development of pancreatic fibrosis. Taken together, our data suggest that DBTC induced chronic pancreatitis was attenuated by mMCP-1 gene transfer, histologically and enzymatically. It is reported that local and systemic production of many types of cytokines and chemokines are involved in the course of chronic pancreatitis as recruitment and activation of infiltrating cells are known to depend greatly on the local cytokine and chemokine production of inflammatory tissues.7 mMCP-1 gene transfer inhibited MCP-1, PDGF, and inflammatory cytokine (IL-1β, IL-6) expression. These findings indicate that MCP-1 mediated inflammation may be attenuated by mMCP-1 treatment. 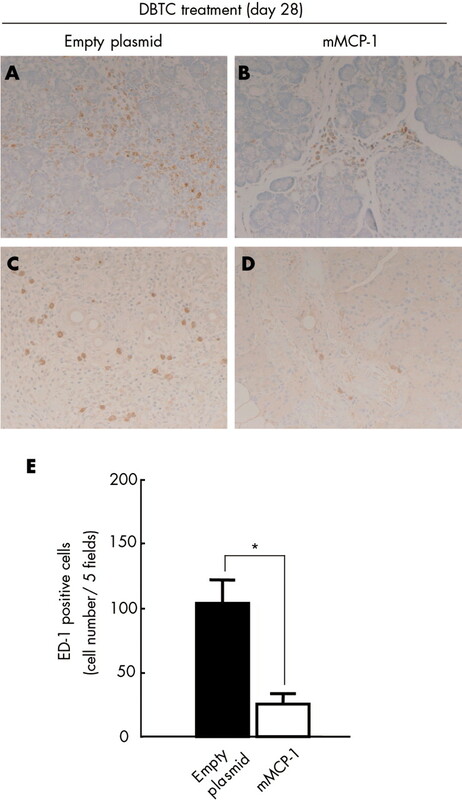 IL-1β is known as a proinflammatory cytokine and induces MCP-1 expression in activated PSCs.26 Investigations concerning IL-6 indicate that it is an excellent predictor of disease severity and mediates the acute phase response.24 PDGF plays a chemotactic effect on activated PSCs and increases PSCs migration.27 Our results suggest that locally produced MCP-1 may not only affect recruitment of monocytes but also attract monocytes and activate macrophages to produce the inflammatory cytokines, chemokines, and growth factors in the development of pancreatic fibrosis. Recently, in relation to pancreatic fibrosis, PSCs were identified and found surrounding blood vessels, pancreatic acini, and ductules.25 Activation of stellate cells was accompanied by expression of the cytoskeletal protein α-SMA and produced most of the components of collagen and the extracellular matrix in vitro.26 In our study, lesions in mMCP-1 transfer rats showed a decrease in α-SMA protein expression compared with empty plasmid treated rats. As shown in fig 7, MCP-1 was induced not only from monocytes/macrophages but also from injured acinar cells and ductal cells and probably also from other damaged pancreas tissue such as endothelial cells and smooth muscle cells. It is reported that activated pancreatic stellate cells produce MCP-1 following administration of lipopolysaccharide in a dose dependent manner.28 More direct evidence for the involvement of MCP-1 in extracellular matrix deposition has been reported.7 Recent studies have suggested that MCP-1 acts as a fibrosis promoting chemokine; MCP-1 stimulated collagen gene expression via endogenous upregulation of TGF-β in rat lung fibroblasts.29 TGF-β has a fibrogenic effect by stimulating synthesis of the extracellular matrix.5 MCP-1 may have a prefibrogenic effect as clinically MCP-1 expression by myofibroblasts is increased in fibrous tissue sections from patients with chronic pancreatitis.7 Therefore, control of MCP-1 expression is thought to be an important therapeutic target for pancreatic fibrosis as well as inflammation. Hypothesis describing attenuation of the development of pancreatic fibrosis induced by dibutyltin dichloride (DBTC) in rats by the human dominant negative inhibitor of monocyte chemoattractant protein 1 (mMCP-1). CCR-2, C-C chemokine receptor; α-SMA, α smooth muscle actin; TGF-β, transforming growth factor β; PDGF, platelet derived growth factor; IL-1β, interleukin 1β; IL-6, interleukin 6. In addition, timing of gene transfer needs to be considered. We observed that serum endogenous MCP-1 levels increased rapidly on day 1 after DBTC injection and then decreased on day 3. However, on day 7, levels increased again and slowly declined on days 14 and 28. Pancreatic content of MCP-1 showed peak levels one week later.10 Moreover, transgene expression via the intramuscular route showed peak production 3–4 days after injection and continued for at least 2–3 weeks.13 In this study, the mMCP-1 gene was injected at the times mentioned above. Using this gene transfer protocol may reduce early pancreatic inflammation and thus attenuate the development of pancreatic fibrosis. In conclusion, our findings suggest that monocyte/macrophage recruitment and the systemic MCP-1 signal pathway contribute to the progression of chronic pancreatitis, and that blockade of MCP-1 may suppress the development of pancreatic fibrosis. TI (14570477) was supported by a grant from the Ministry of Education, Culture, Sports, Science, and Technology, Japan. This work was supported by grants from the Research of Specific Diseases, Intractable Diseases of the Pancreas, Health and Labour Sciences Research Grants, Japan, and the Institution of Pancreas Research Foundation of Japan. The authors thank Mr SE Rife and Mr H Matsuo for their contribution to this article. Dimagno EP, Layer P, Clain JE. Chronic pancreatitis. In: Go VLW, Di Magno EP, Gardner JD, et al, eds. The pancreas:biology, pathology and disease, 2nd edn. New York: Raven, 1993:665–706. Valente AJ, Rozek MM, Schwartz CJ, et al. Characterization of monocyte chemoattractant protein-1 binding to human monocytes. Biochem Biophys Res Commun1991;176:309–14. Taub DD, Proost P, Murphy WJ, et al. Monocyte chemotatic protein-1 (MCP-1), -2, and -3 are chemotactic for human T lymphocytes. J Clin Invest1995;95:1370–6. Sparmann G, Merkord J, Jaschke A, et al. Pancreatic fibrosis in experimental pancreatitis induced by dibutyltin dichloride. Gastroenterology1997;112:1664–72. Merkord J, Jonas L, Weber H, et al. Acute interstitial pancreatitis in rats induced by dibutyltin dichloride (DBTC): pathogenesis and natural course of lesions. Pancreas1997;15:392–401. Saurer L, Reber P, Schaffner T, et al. Differential expression of chemokines in normal pancreas and in chronic pancreatitis. Gastroenterology2000;118:356–67. Grady T, Liang P, Ernst S, et al. Chemokine gene expression in rat pancreatic acinar cells is an early event associated with acute pancreatitis. Gastroenterology1997;113:1966–75. Demols A, Van Laethem JL, Quertinmont E, et al. N-acetylcysteine decreases severity of acute pancreatitis in mice. Pancreas2000;20:161–9. Inoue M, Ino Y, Gibo J, et al. The role of MCP-1 (monocyte chemoattractant protein-1) in experimental chronic pancreatitis model induced by dibutyltin dichloride in rats. Pancreas2002;25:e64–70. Zhang YJ, Rollins BJ. A dominant negative inhibitor indicates that monocyte chemoattractant protein 1 functions as a dimmer. Mol Cell Biol1995;15:4851–5. Zhang YJ, Rutledge BJ, Rollins BJ. Structure/activity analysis of human monocyte chemoattractant protein-1 (MCP-1) by mutagenesis: identification of a mutated protein that inhibits MCP-1-mediated monocyte chemotaxis. J Biol Chem1994;269:15918–24. Egashira K, Koyanagi M, Kitamoto S, et al. Anti-monocyte chemoattractant protein-1 gene therapy inhibits vascular remodeling in rats: blockade of MCP-1 activity after intramuscular transfer of a mutant gene inhibits vascular remodeling induced by chronic blockade of NO synthesis. FASEB J2000;14:1974–8. Ueki T, Kaneda Y, Tsutsui H, et al. Hepatocyte growth factor gene therapy of liver cirrhosis in rats. Nat Med1999;5:226–30. Ceska M, Briath K, Brown B. A?new and rapid method for the clinical determination of α-amylase activities in human serum and urine. Clin Chim Acta1969;26:437–44. Lowry OH, Rosebrough NJ, Farr AL, et al. Protein measurement with the Folin phenol reagent. J Biol Chem1951;193:267–85. Weidenbach H, Lerch MM, Turi S, et al. Failure of a prolyl 4-hydroxylase inhibitor to alter extracellular matrix deposition during experimental pancreatitis. Digestion1997;58:50–7. Varela L, Margot I. Tumor necrosis factor-α: a multifunctional regular of mammary gland development. Endocrinology1996;137:4915–24. Takano S, Kimura T, Yamaguchi H, et al. Effects of stress on the development of chronic pancreatitis. Pancreas1992;7:548–55. Damoiseaux JG, Dopp EA, Calame W, et al. Rat macrophage lysosomal membrane antigen recognised by monoclonal antibody ED1. Immunology1994;83:140–7. Reyes-Reyna SM, Krolick KA. Chemokine production by rat monocytes exposed to interferon-gamma. Clin Immunol2000;94:105–13. Strate T, Yekebas E, Knoefel WT, et al. Pathogenesis and the natural course of chronic pancreatitis. Eur J Gastroenterol Hepatol2002;14:929–34. Rollins BJ. Monocyte chemoattractant protein 1:a potential regulator of monocyte recruitment in inflammatory disease. Mol Med Today1996;2:198–204. Madhav B, Mark B, Sheila S, et al. Inflammatory mediators in acute pancreatitis. J Pathol2000;190:117–25. Apte MV, Haber PS, Applegate TL, et al. Periacinar stellate shaped cells in rat pancreas: identification, isolation, and culture. Gut1998;43:128–33. Phillips PA, Wu MJ, Kumar RK, et al. 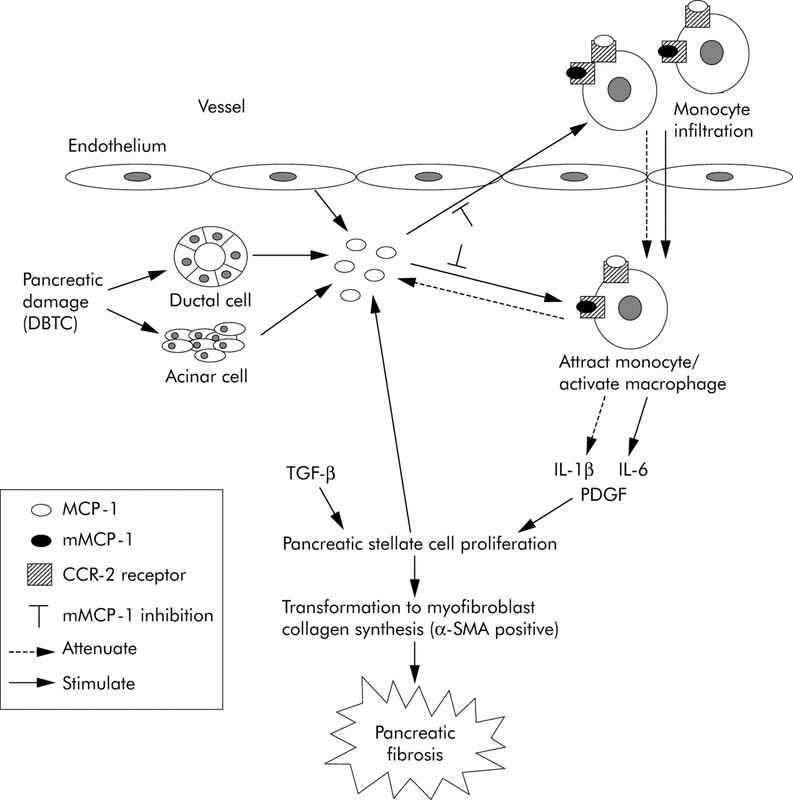 Cell migration:a novel aspect of pancreatic stellate cell biology. Gut2003;52:677–82. Gibo J, Ito T, Kawabe K, et al. Camostat mesilate attenuates pancreatic fibrosis via inhibition of monocytes and pancreatic stellate cells activity. Lab Invest2005;85:75–89. Masamune A, Kikuta K, Satoh M, et al. Ligands of peroxisome proliferator- activated receptor gamma block activation of pancreatic stellate cells. J Biol Chem2002;277:141–7. Kitamoto S, Egashira K. Anti-monocyte chemoattractant protein-1 gene therapy for cardiovascular diseases. Expert Rev Cardiovasc Ther2003;1:393–400. Inoshima I, Kuwano K, Hamada N, et al. Anti-monocyte chemoattractant protein-1 gene therapy attenuates pulmonary fibrosis in mice. Am J Physiol Lung Cell Mol Physiol2004;286:L1038–44. Wada T, Furuichi K, Sakai N, et al. Gene therapy via blockade of monocyte chemoattractant protein-1 for renal fibrosis. J Am Soc Nephrol2004;15:940–8. Tsuruta S, Nakamuta M, Enjoji M, et al. Anti-monocyte chemoattractant protein-1 gene therapy prevents dimethylnitrosamine-induced hepatic fibrosis in rats. Int J Mol Med2004;14:837–42. Imamura M, Ogawa T, Sasaguri Y, et al. Suppression of macrophage infiltration inhibits activation of hepatic stellate cells and liver fibrogenesis in rats. Gastroenterology2005;128:138–46.